Podszuck® was established in Stettin in 1919 and moved to Kiel in 1945. The product range includes fire personal doors, industrial doors and frames for the marine and building industry. Since 1975 Podszuck® has made fire door protection its speciality and is today one of the leading manufacturers in Europe. Podszuck® is strenghtening and expanding its reputation as a competent partner for the marine industry. The product range fulfills the high demand for fire doors from the outfitters, shipowners and yards worldwide. 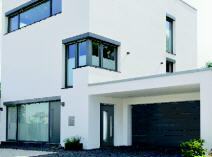 We produce a wide range of doors, complete with control systems, hardware and equipment. Click on a productname for detailed information about that door. We hope this is of interest and we would be very pleased to assist you with further information (technical drawings, certificates etc.). To gain a quick overview simply use our door list with descriptions. The quality system of Podszuck® GmbH is in accordance with DIN EN ISO 9001 : 2000.